Is the S4 helix of Hv Short? In this post, I will elaborate upon a statement I made in last week’s post. There, I discussed how important a proper alignment of the S4 helices in voltage sensor domains (VSDs) is for building accurate homology-based structural models of these domains. When discussing the potential alignments I stated that “since the different conformations of the VSDs between the two channels may vary significantly, it may be impossible to define a correct [S4] alignment.” Here, I will expand upon how the differences in the conformations of VSDs could lead to complications in aligning the S4 helices. First, I will introduce the concepts of “sequential” versus “gap” alignments. Then, I will use a thought experiment to illustrate why, if considering mechanistic or functional criteria, using the gap alignment model may be a better way of aligning the S4 helix. Finally, I will briefly discuss the work of Xu et al., in which they test the function of Kv1 (Shaker) S4 deletion mutants, to see what evidence for the gap model may exist. Figure 2. A selection of many possible S4 alignments between Kv1.2-2.1 paddle chimera and human Hv1 (hHv1). The gating-charge residues are color coded by position. Fig.1 shows a selection of several possible S4 alignments between the Kv1.2-2.1 paddle chimera and human Hv1. The S4 gating charge residues are colored by their position in Kv1 VSDs: R1 red, R2 yellow, R3 green, R4 blue, K5 cyan and R6 pink (Fig.1 top sequence). (Remember that glutamine (Q1) is equivalent to R1, since it comes from the Kv2.1 sequence— this position is an arginine (R) in native Kv1.2.) In the human Hv1 sequences, the S4 arginines are colored based on the corresponding Kv1.2-2.1 paddle chimera gating charge residue. The top two Hv1 sequences are examples of possible “sequential” alignments in which the three S4 arginines of Hv1 are aligned with three corresponding gating charge residues of the Kv1.2-2.1 paddle chimera that directly follow each other one after the other in sequence. Keep in mind that these two sequential alignments shown are only examples of many possible such alignments. The bottom two alignments in Fig.1 are different: they represent “gap” alignments in which the corresponding gating charge residues on the S4 of the Kv1.2-2.1 paddle chimera do not directly follow one another in sequence. In these alignments, an S4 gating charge residue may be skipped or passed over when aligning with the S4 arginines of the Hv1 sequence, resulting in a gap (dashed lines in Fig.1). These gap alignments imply that the S4 sequence of Hv1, in addition to having fewer positively charged residues, may actually be shorter or more compressed with respect to the S4 of Kv1 VSDs. In addition, the gap alignments imply that it may be more proper to consider the mechanistic roles of the different gating charge residues when trying to align them. The sequences of the S4 helices alone do not provide us with any particular reason to propose that the gap alignments may constitute a more accurate alignment, nor do the sequences alone provide strong reasons to prefer any one particular sequential alignments over another. So, if it isn’t possible to determine the correct alignment from the sequences, why complicate things by proposing possible gap alignments? In the next section, from the safety of a thought experiment, I will discuss how the depolarized and hyperpolarized conformations of the different VSDs may offer strong supporting arguments for a serious consideration of the gap model for S4 alignment. It is almost certain that the VSD conformational change required to open the voltage-gated K+ channel and that required to open Hv are significantly different. Here, I speculate on what the degree of conformational change may be in the two different VSDs and try to use this thought experiment to get a better idea of whether gap alignments are more appropriate between the Kv1.2-2.1 paddle chimera and human Hv1 S4 helices. Figure 2. Cartoon representations of possible depolarized and hyperpolarized conformations of the Kv1 and Hv1 VSDs. 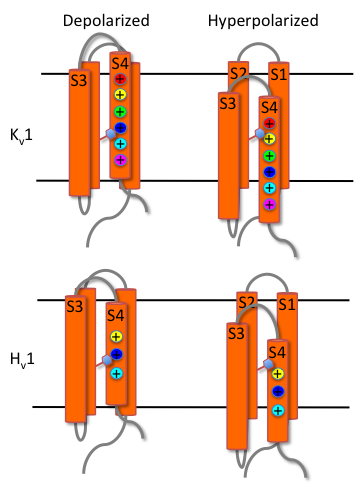 The four transmembrane helices of the VSDs (S1-S4) are shown as orange cylinders. The S4 gating charge residues are colored by position as in Fig.1. The charge transfer center is located directly below the “phenylalanine gap” represented as a blue hexagon protruding from S2. The membrane boundaries are shown as black lines. Fig.2 shows cartoon representations of possible depolarized and hyperpolarized conformations of a Kv1 VSD (top) and a Hv1 VSD (bottom). The four transmembrane helices of VSDs are shown as orange cylinders and the membrane boundaries are indicated by the black horizontal lines. The gating charge residues of the Kv1 S4 helix are shown as “+” and are colored the same as in Fig.1, based on their position along the S4 sequence. The charge transfer center is located directly below the “phenylalanine gap” depicted in the cartoons by the blue hexagon protruding from S2 (Fig.2). The cartoon representing the depolarized conformation of the Kv1 VSD (Fig.2 top left) shows lysine 5 (K5, cyan) in the charge transfer center. This is the conformation seen in the experimentally determined structure of the Kv1.2-2.1 paddle chimera (Long et al., 2007). The hypothetical hyperpolarized conformation of the Kv1 VSD (Fig.2 top right) is shown with arginine 2 (R2 yellow) in the charge transfer center. There is no experimentally determined structure of this conformation for any VSD; therefore, this cartoon represents of a hypothetical conformation based on the gating-charge-transfer model of VSD mechanism (Tao et al., 2010). Although we do not have a structure of this conformation, it is know that S4 and the top half of the S3 helix (known as S3b) are displaced downwards (into the membrane) in this conformation (Ruta et al., 2005). The cartoon representing the depolarized conformation of Hv1 (Fig.2 bottom left) shows the third S4 arginine in the charge transfer center (cyan) and the one representing the hyperpolarized conformation (Fig.1 bottom right) shows the first S4 arginine in the charge transfer center (yellow). We do not have an experimentally determined structure of any Hv channel—in other words, it is possible that the true depolarized and hyperpolarized conformations of Hv1 channels don’t look anything like the cartoons shown in Fig.2. However, it is not totally unreasonable that the conformations may look something like them. It seems likely that, if Hv1 has a charge transfer center similar to that of other VSDs (the necessary amino acid residues are present and well positioned in the Hv1 sequence, i.e. Phe149 or Phe150 on S2 may form the phenylalanine gap and Glu153 on S2 and Asp174 on S3 may provide the counter charges), then the charge transfer center would be occupied by different positively charged S4 arginines in the different conformations. I say this being fully aware of the recent NavRh structure in which the charge transfer center was devoid of a positively charged S4 gating charge residue (Zhang et al., 2012). Therefore, although the positions of these residues in the proposed conformations is speculative, let’s examine the possible implications with respect to S4 alignments. The conformations proposed in Fig.2 lead to a simple, but significant, observation. The degree of S4 movement when going from the depolarized to hyperpolarized conformations is different between Kv1 and Hv1 . In order to move from having K5 in the charge transfer center in the depolarized conformation to having R2 in the charge transfer center in the hyperpolarized conformation, the Kv1 S4 must pass over both R4 and R3 (blue and green, respectively). In contrast, in order for Hv1 S4 to go from having the third S4 arginine in the charge transfer center in the depolarized conformation to having the first S4 arginine in the charge transfer center in the hyperpolarized conformation, it must only pass over the second S4 arginine (blue). Hence, the proposed conformational changes required to gate the two channels are different. The S4 of Kv1 has to move further between conformations than does the S4 of Hv1. How does this affect our thinking about sequence alignments? Let me just say that the coloring of the positive signs (+) representing the S4 arginines of Hv1 in Fig.2 was not accidental. It seems to me that, when thinking about the possible differences in the conformations of the VSDs, it may be more appropriate to equate the gating charge residues that occupy the charge transfer center in the equivalent conformations than to align them simply based on the sequential order in which the residues appear along S4. In this way, since K5 of the Kv1 S4 and the third S4 arginine of Hv1 both occupy the charge transfer center in the depolarized conformation, they are “aligned” (both colored cyan in Fig.2). The same can be said about R2 of the Kv1 S4 and the first S4 arginine of Hv1 (both colored yellow in Fig.2). However, due to the different degree of conformational change of S4 discussed above, this conformation- or mechanism-based alignment leads to the two possible gap alignments shown in Fig.1 (bottom two alignments). Now that we have used the safety of a thought experiment to speculate upon the possible different conformations of the Kv1 and Hv1 VSDs, we can imagine how the gap alignments may in fact reflect mechanistic considerations for the roles of the different S4 gating charge residues. However, is there any evidence for this in the literature? In their recent work, Xu et al. systematically characterized several different S4 deletion mutants of the Shaker Kv1. In this extremely data-rich paper, they demonstrate that the voltage sensor paddle motif (made up of S3b and the top half of S4) is extremely resistant to perturbations and can, in fact, be completely deleted with the channel still retaining voltage-gated character (Xu et al., 2010). It is not my purpose here to discuss all of the results from this paper (although I highly recommend reading this paper for anyone interested in the mechanism of voltage gating); I will only be pointing out a few interesting observations they made that can help us think more about the potential relevance of the gap alignment model. First, I should mention, that the plot of the open probability as a function of voltage (the Boltzmann plot) for Kv1 and Hv1 channels are very different. The two classes of channels have very different voltages at their midpoints of activation (the voltage at which the open probability equals 1/2, known as the Vm, Shaker Vm ≈ -40 mV whereas human Hv1 Vm ≈ +40 with symmetrical pH). The large difference in these midpoints arises from the mechanistic differences of their respective VSD conformational changes. Any alignment between two S4 helices makes an implicit statement: any mutagenesis work that transfers the aligned residues from one S4 helix to the other should in principle change the mechanism of the VSD to be more like that of the other. Hence, if the alignment is correct, giving the equivalent residues the alternate sequence should shift the midpoint of activation towards that of the other. Of course, it is not likely that you would completely reproduce the mechanism of the channel in this way: the S4 helix is not operating in a vacuum and, hence, the gating mechanism is heavily influenced by residues on the other transmembrane helices (S1-S3). However, if such a study were performed, and if it displayed a clear trend going from one midpoint (Vm) toward the other as the S4 was sequentially mutated between sequences, it would provide some experimental support for that particular alignment. Unfortunately, very few examples of such systematic mutagenesis studies exist in the literature. One such study that is of particular interest is the aformentioned work of Xu et al. , in which they deleted amino acid residue triplets from the S4 helix. The triplets consisted of one gating charge residue plus the two successive hydrophobic residues (Xu et al., 2010). Although the kinetics of channel opening are different between the different gating charge triplet deletions, the VSDs containing these shortened S4 helices are all still functional and, importantly, removal of any of the first four gating charge triplets resulted in a significant shift of the Vm towards the right (i.e., to more positive membrane potentials). Hence, making the S4 helix of the Shaker Kv1 channel shorter shifts its gating to be more Hv-like. Notably, when sextuplets (i.e. pairs of successive gating charge triplets) were deleted, functional channels were again produced. Moreover, only removal of the R3-R4 sextuplet caused a significant rightward shift of the Vm (the other sextuplet deletions caused significant changes in the gating kinetics, but did not result in big Vm shifts). These observations tell us two things. Firstly, VSDs with significantly shortened S4 helices are functional. Secondly, shortening the S4 helix can result in a more right-shifted Vm. This does not prove that the S4 helix of Hv is shorter than that of Kv1, but it does demonstrate that it is certainly a possibility. We may even be able to use these data to infer specific Kv1 S4 gating-charge residues that can be matched up with those of Hv in gap alignments. It is clear that when trying to align the S4 helices of VSDs there are many things to consider. Here, I introduce even more complexity to the problem by proposing non-sequential gap alignments. I discuss how these alignments may arise when considering the mechanistic or function equivalency of aligned S4 gating charge residues. In the case of Hv these gap alignments would imply that the S4 helix is shorter than those of Kv1. This idea is supported by the fact than when the S4 helix of the Shaker Kv1 is made shorter by deletions, the VSDs remain functional and some deletions shift the Vm of the channels to be more Hv-like. Of course, we won’t really know the answer to the title question until we have an experimentally determined structure of Hv. What do you think? Does it seem plausible to you that the S4 of Hv is shorter than that of Kv1 channels? Do you think the gap alignment model may be the correct way of defining S4 alignments? Please contribute your comment and questions.